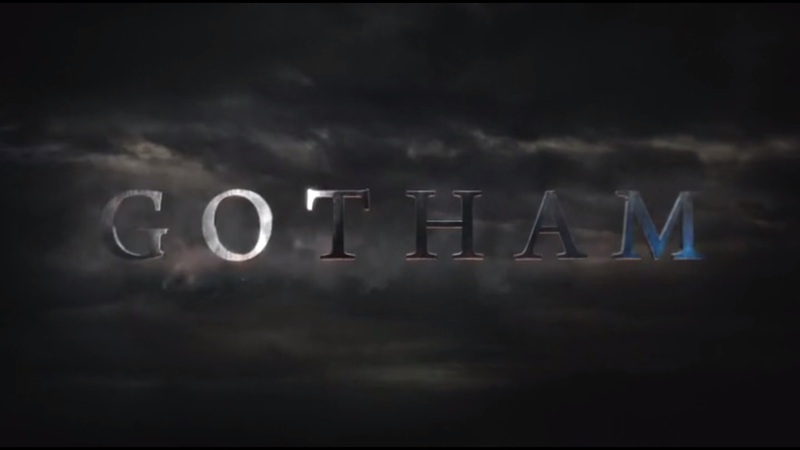 A Look at Gotham- Series Premiere: “Pilot” | What Else is on Now? There’s been a lot of speculation about Gotham, long before it came out. It’s another look at Gotham City, coming off the heels of Christopher Nolan’s Batman trilogy. 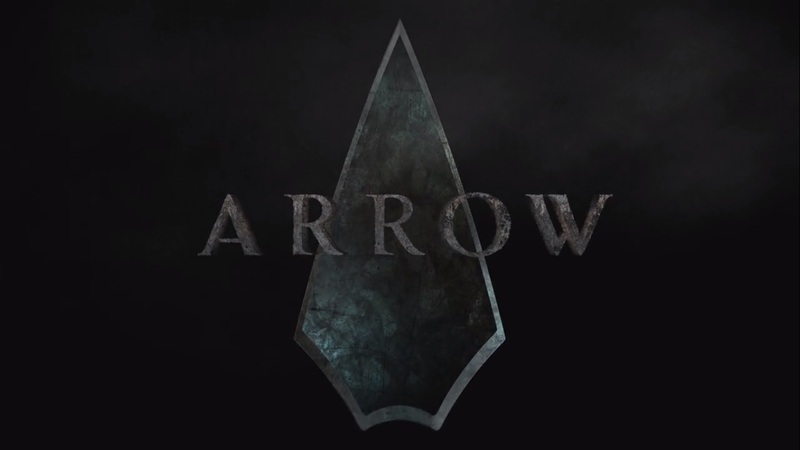 It comes at a time when shows like Agents of S.H.I.E.LD., Arrow, and the upcoming Flash series show superheroes done on the small screen. 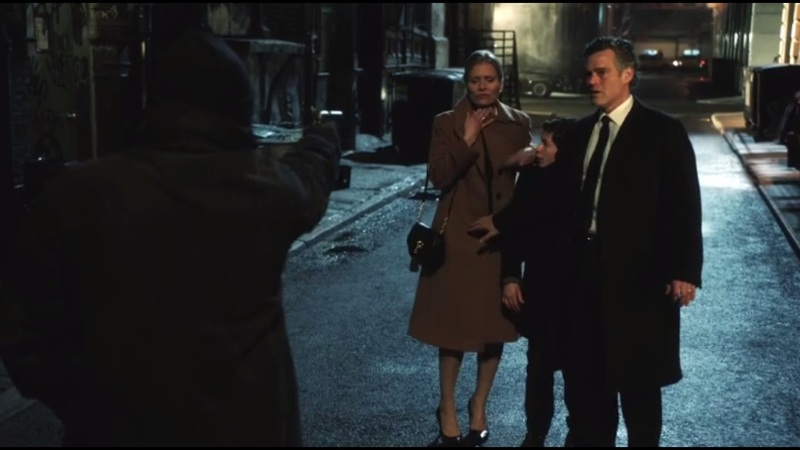 Rather than focusing on Bruce Wayne, the series takes a look at a young James Gordon as he comes to Gotham City and learns what kind of hellhole he’s walked into. The trailers raised a lot of eyebrows: Jada Pinkett Smith? Is that a young Penguin? Ivy Pepper? The same as Poison Ivy? Nygma works at the Gotham City Police Department? And what’s Selina Kyle doing besides just hanging around wherever she goes? A lot of eyebrows were raised, but it looked interesting, to say the least. Batman has been around for a very long time and there will always be a new incarnation or reimagining of him. Now, fans won’t just look down upon a new version of Batman because it’s not their Batman, if the Nolan films are any indication of anything. Some prefer the more campy Adam West series. Others may like the Tim Burton films over any other version. Some, like me, still hold the Bruce Timm animated series in high regard. My point is that even if this isn’t what you think of when you think Batman or Gotham City, that’s perfectly fine. In my opinion, the pilot to Gotham is different. It has some interesting ideas and good chemistry between Gordon and Bullock. The pilot isn’t without its problems, but I do plan to stick around and at least see where the series is headed. 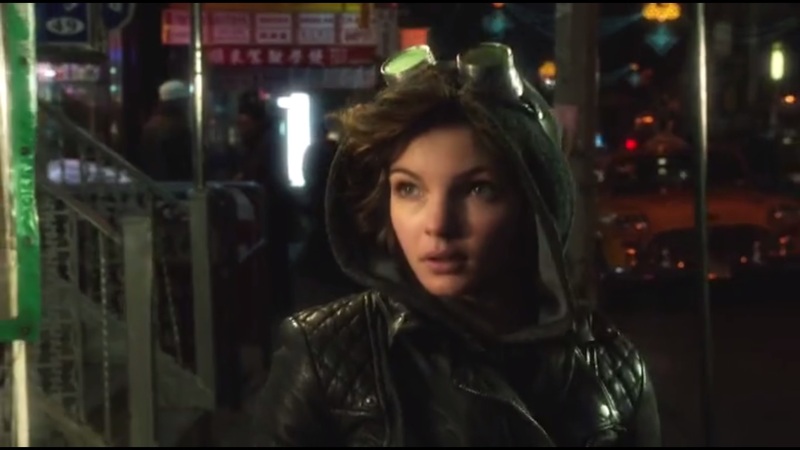 The series begins with a mute Selina Kyle, played by Camren Bicondova, doing what she does best: running and robbing. On this evening in particular, she spots a family walking down an alley. These are the Wayne’s: Martha, played by Brette Taylor, Thomas, played by Grayson McCouch and, of course, master Bruce, played by David Mazouz. Apparently, these Wayne’s learned nothing from past incarnations, as they once again walk down an alley after leaving a theater. We know where this is going. A robber approaches and demands the money and necklace. Despite getting that, the shooter still downs Martha and Thomas in cold blood, but leaves Bruce alone and alive. 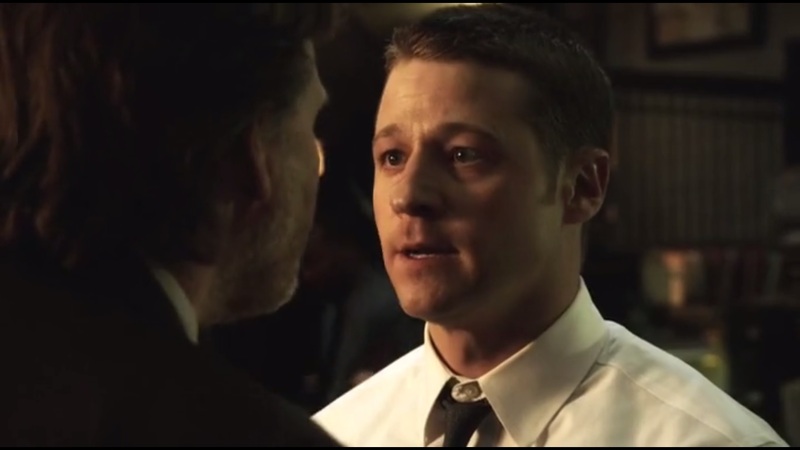 We’re then introduced to Detective James Gordon, played by Ben McKenzie. Gordon is new to the Gotham Police Department and came to the city because that’s where the action is. Odd reason, but sure, Gotham has the action. Jim is paired with Detective Harvey Bullock, played by Donal Logue and the two are sent to a crime scene involving the Wayne family. Bullock is prepared to hand this case over to the Major Crimes Unit, as he doesn’t want it, but Jim goes to Bruce Wayne and asks him about what happened. Gordon sympathizes with Bruce- a drunk driver hit his family’s car and killed his father, so he knows how Bruce feels. The world can be a dark and scary place, but people like Jim and Bruce must be strong. He promises to find out who did it. Now that Bruce is orphaned, he’s left in the care of his butler, Alfred Pennyworth, played by Sean Pertwee. The two detectives later discuss the case, with Bullock filling Gordon in on who the Wayne’s are and how powerful they are in Gotham. Bullock wants to close the case fast, but the perp could literally be anyone. Also, Gordon has just a bit too much fire in his soul for Bullock, but despite that, Bullock can’t just get rid of him. As such, he orders Gordon to just keep his trap shut and do as he’s told. 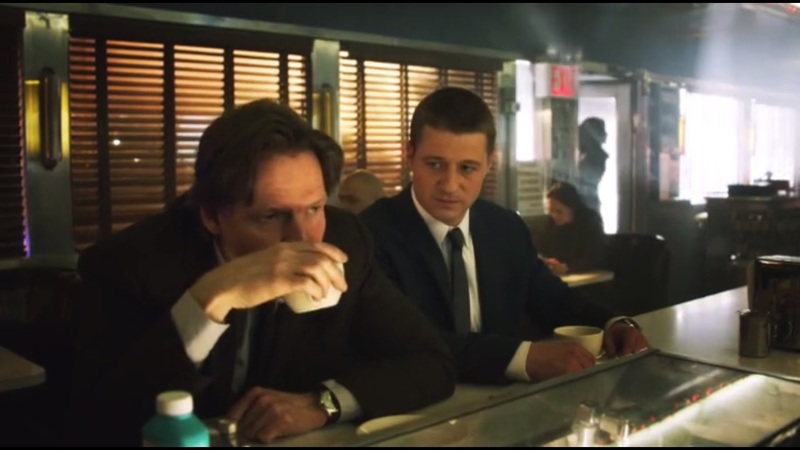 Gordon refuses to leave anyway, though Bullock lets him know that Gotham isn’t the right place for optimistic cops like Gordon. 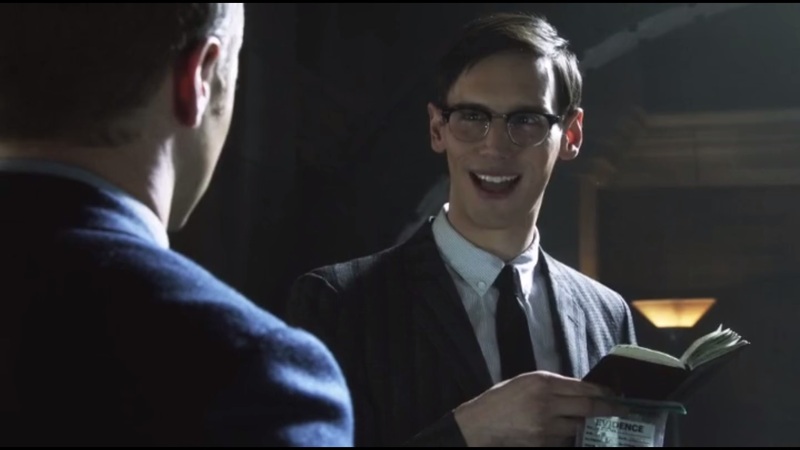 We then meet Gotham PD’s coroner, Edward Nygma, played by Cory Michael Smith, who finds that the bullet that killed Thomas Wayne came from a gun not listed in the department’s database. And no prints, either. Also, what’s nowhere, but everywhere, except where something is? Nothing, which is exactly what else Nygma has for Bullock and Gordon. Terrific. Now, what are the odds that a professional killer would know that the Wayne’s planned to come down that particular alleyway that evening? Not too big. Hence, Bullock figures it’s time to pay a visit to Fish Mooney, who works for businessman Carmine Falcone. Following this, we’re introduced to Fish Mooney, played by Jada Pinkett Smith, and learn two things about her: she’s good with a baseball bat and does not like her hair getting wet. Luckily, if her hair gets frizzy, the only one who suffers is her lackey, Oswald Cobblepot, played by Robin Lord Taylor. When Mooney learns of Bullock’s arrival, she heads in while Cobblepot gets in a few swings at Mooney’s thieving staff member. The other thugs tell “Penguin” to take it easy. Why Cobblepot is called “Penguin,” even as a nickname, at this point, I don’t know. Mooney and Bullock, old friends, reacquaint and Mooney is introduced to Gordon. Later that evening, Jim airs out his grievances to his fiancé, Barbara, played by Erin Richards and about making little to no progress on the Wayne murders. He made a promise to Bruce and can’t deliver, but will. Though Jim feels he may be out of his depth, Barbara gives him a quick motivational boost, among other remedies. Later that evening, Jim gets a call from Harvey about a lead. They meet up at an apartment and Harvey fills Jim in on what he’s learned: one of Fish Mooney’s associates heard that a guy tried to sell an antique, four strand pearl necklace with one strand broken, similar to Martha Wayne’s. The guy’s name is Mario Pepper, who already has a long rap sheet. Inside, Ivy Pepper, played by Clare Foley, answers the door and warns the detectives that they probably won’t want to talk to her father. He’s a mean man. When Mario Pepper answers, the cops question his whereabouts the night of the Wayne’s murder. He says he was at home and his wife vouches for him, but if that’s the case, then he’ll have no problem if the detectives search his home. Normally, you’d need a warrant for that, but Mario is a felon on parole, so all the detectives need is reasonable cause. Huh. All right, I guess. So Mario does the unreasonable thing and runs. The chase leads to a fight in the alley between Gordon and Pepper, with Pepper gaining the advantage due to his size and stature. Before he can finish off Gordon, Bullock downs him with a single shot. Shortly after this, officers swarm the Pepper apartment and, in no time at all, find Martha Wayne’s necklace. Case solved! If I can say something positive about Gotham, it’s that there seems to be a lot of ambition and drive behind this series. I say seems because a lot of characters and threads are introduced in this pilot to entice viewers to keep watching. Sure, this is nothing new in television and it’s important to remember that a lot of concepts, character motivations and personalities may change or be dropped altogether by the time the series ends. As such, the pilot feels the need to put in a lot of cameos and name drop hints that Batman fans will recognize, but they feel like unnecessary Easter Eggs. 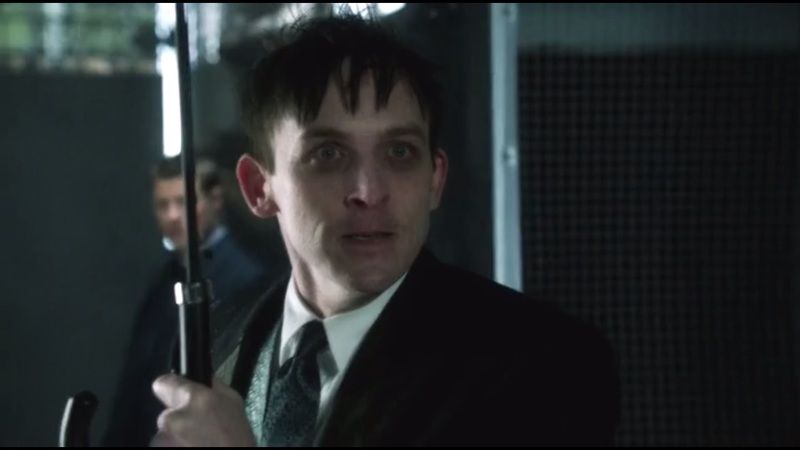 For example, Cobblepot is called “Penguin,” a nickname that he hates. But why is he called that? He doesn’t have flippers and he doesn’t make a quack sound, a-la Burgess Meredith, so why do people call him “Penguin?” Same goes with Nygma. Does the guy have to only talk in mostly riddles and questions? And you could have given Selina Kyle one line of dialogue instead of just showing us that she exists. We saw her in the trailer. She was bound to show up eventually. Oh, and tell me that these two title cards aren’t similar at all. I do like the tone of the show so far. It’s very serious, even if feels a bit cheesy at times. 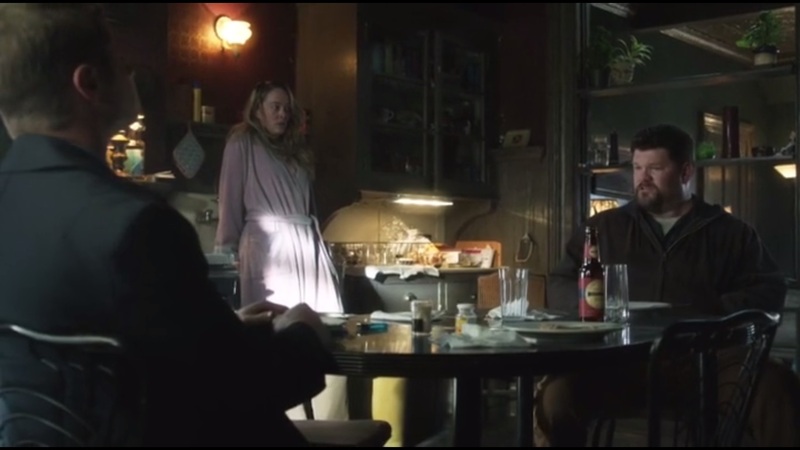 The chemistry between McKenzie and Logue is the strongest part of the episode, in my opinion. Gordon is the optimist and idealist who just wants to do the right thing, while Bullock is the hardened, seasoned cop who knows the seedy underbelly that is all of Gotham City. You can tell that, even though he doesn’t like Gordon, he won’t watch Gotham’s criminals eat him alive. Sure, he can’t get rid of Gordon, but he does save him from Pepper instead of letting him get the hell beat out of him so he can lose that optimism. I do wish we got to learn more about why Gordon is so optimistic about being in Gotham. He says he came there because that’s where the action is, but if he wanted action, he easily could have moved to Metropolis and helped clean it up after Superman and General Zod turned the city into a wasteland last year. It’s the pilot and I’m sure we’ll get more into Gordon’s head as the series continues, but I didn’t hate what I watched. Are there slip-ups? Of course. The acting isn’t always great, the Easter Eggs feel forced and Gordon himself, the character we’re following, isn’t all that much of a draw right out of the gate. 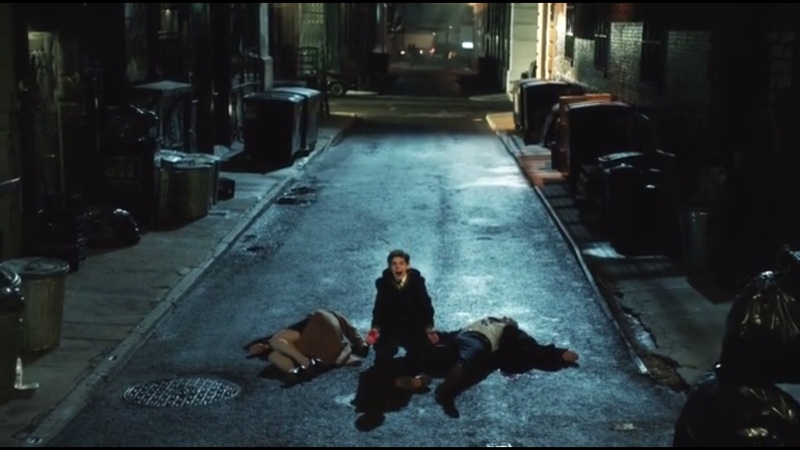 For now, Gotham is a decent start, but there’s a lot of ground to cover. I’ll be keeping watch. This entry was posted in Gotham and tagged Alfred Pennyworth, Barbara Kean, Ben McKenzie, Bruce Wayne, Camren Bicondova, Carmine Falcone, Catwoman, Cory Michael Smith, Detective James Gordon, Donal Logue, Edward Nygma, Erin Richards, Fish Mooney, FOX, Gotham City, Harvey Bullock, Jada Pinkett Smith, Martha Wayne, Oswald Cobblepot, Robin Lord Taylor, Sean Pertwee, Selina Kyle, Thomas Wayne by omarid513. Bookmark the permalink.